Got up early in the park and got a shower then coffee. 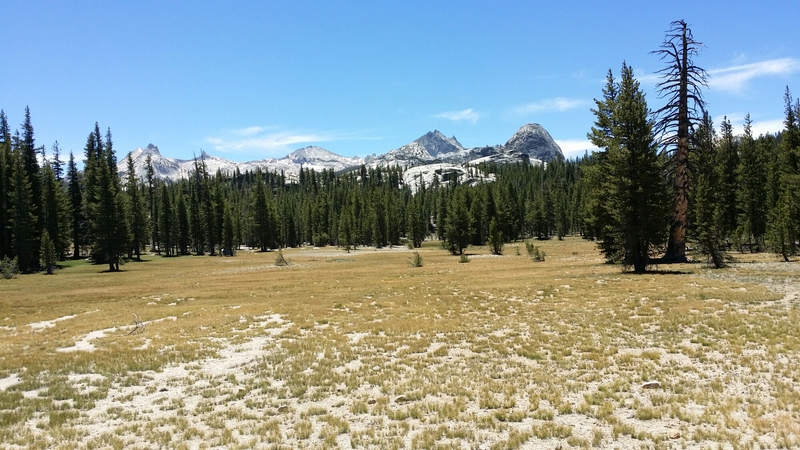 We got the bus up to Tuolumne Meadows at 8am and the driver was nearly a tour guide, he covered all the history and interesting tidbits about the park, I was really happy with the ride. Bounced my bounce bucket up to South Lake Tahoe. Hiked up to a waterfall for lunch and swimming. It was amazing. Found out some other hikers are off trail, which is always sad but understandable, at two months life comes creeping back in. Bills come up, family things come up, work calls, obligations, things happen — life happens and it becomes harder to say no for people. People are taking more zeros, some taking up to four in Yosemite, and motivation is harder to come by it seems. 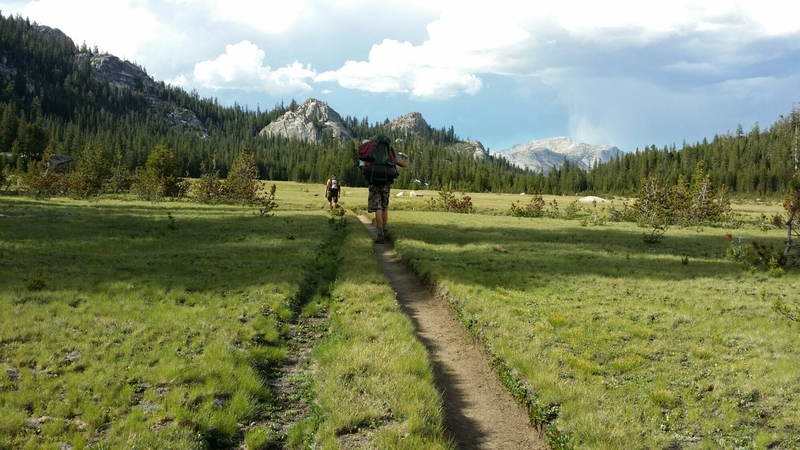 The early excitement is faded and people talk about how now that the Sierra is winding down, only four days left, there is not a ton of exciting things left on the trail and it is all spaced out. ‘How long until Crater Lake?’ Is a common question heard recently. First day after Yosemite we also had an 8.2 mile dry stretch, that is weird for the Sierra where half the time the trail is a stream. You hear in the voices the idea that we have some work to do now that the “fun stuff” is over. 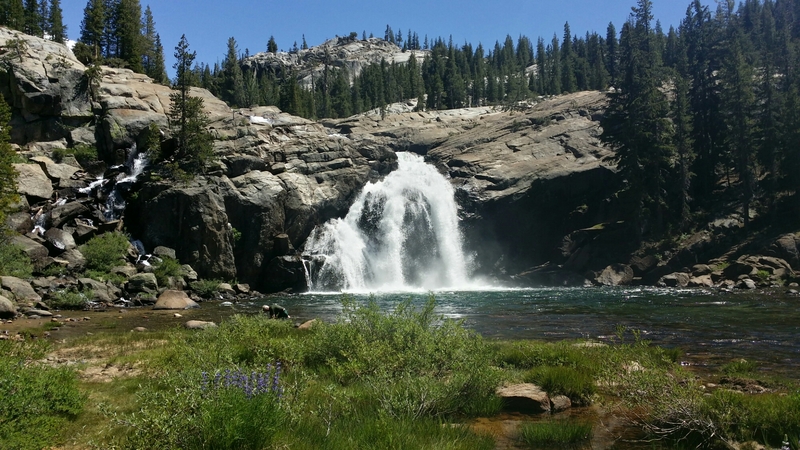 I get it, after the desert the Sierra is like the land of milk and honey (with some mosquitoes). Trail fatigue seems to be hitting everyone a bit, myself included, though I am looking forwards to Oregon, it should be in roughly four weeks. Being in Ashland again will be great, I know the town well as I lived there for some years. I am even looking ahead eagerly to stops like Leavenworth Washington and Mt. Shasta in Northern California. It is tough being on trail this long, it is. I just hope we don’t lose too many more. Talked today with Waffles about some of this and he told me about walking in the lava that is coming up, that it is like walking on the moon.